He said that in the past he has approached U.S. Forest Service (USFS) officials a number of times about the potential of his product for addressing the trend of hot, massive, deadly wildfires that have blackened the West in recent years. According to Dan, the USFS turned him down each time due to a variety of factors including long-term government contracts with chemical slurry manufacturers, procedural paralysis, and a lack of interest in actually putting out wildfires. Dan Sinclair, the inventor of a substance that will not only slow the spread of fire but douse it completely, is making a deal with one of the largest firefighting agencies in the country to put his product to use. The California Department of Forestry and Fire Protection (CAL FIRE) became interested in the substance as a means of fire mitigation after Free Range Report posted an article about it last spring. The substance, known as Fast Application Containment Systems, or F.A.C.S., is a gluten protein-based product invented and patented by Dan Sinclair, who is president of F.A.C.S Operations. Dan is the son of a firefighter whose early experiences inspired him to seek a better way to protect both lives and valuable resources from the heartbreaking consequences of fire. Remarkably, Dan’s product has no chemical components harmful to the environment or humans, and yet it douses fire with startling effectiveness. Unfortunately the Forest Service and other agencies have been locked into practices which harm both wildlife and forests with chemical slurry drops. During our interview, Dan indicated that despite the fact his product has been commercially available for some time, and that his company is the first private vendor accepted by the Prescott, Arizona Firewise Community, the federal government has shown little interest in F.A.C.S. He said that in the past he has approached U.S. Forest Service (USFS) officials a number of times about the potential of his product for addressing the trend of hot, massive, deadly wildfires that have blackened the West in recent years. According to Dan, the USFS turned him down each time due to a variety of factors including long-term government contracts with chemical slurry manufacturers, procedural paralysis, and a lack of interest in actually putting out wildfires. It’s surprising to no one that effectiveness in putting out fires has taken a back seat to other bureaucratic considerations. Also, the massive amounts of money that go into federal firefighting efforts on public lands has created a mindset with many government officials who find fighting fires more profitable than putting them out. Dan recently told Free Range Report that after our article was posted last spring, his company was contacted by a CAL FIRE chief of research and development (R&D) who wanted to know more about the effectiveness and cost of his containment product. After CAL FIRE reviewed his submission, Dan received an acceptance from the agency which wanted to include F.A.C.S. in its firefighting repertoire. Having also been certified through U.S. Forestry, CAL FIRE is currently in negotiations with Dan to obtain and put his product to work. Dan hopes that it will be used not only in wildland fire mitigation, but for first responders who deal with residential fires and other relatively small incidents. Dan’s acceptance by CAL FIRE is a breakthrough for his company, which has previously been stonewalled by large government agencies. Dan hopes that the use of F.A.C.S. 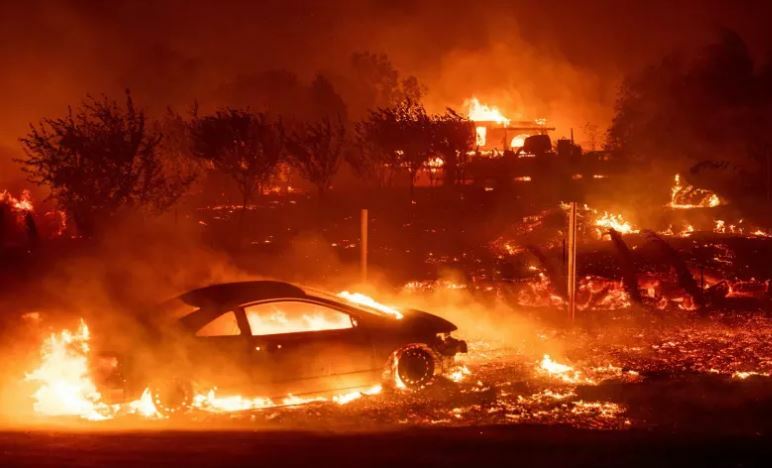 by CAL FIRE and other organizations will prevent the kind of horrendous loss of lives and property that have devastated California and other states this year. Thank you for publishing the article about Dan this year! I’m so happy things are happening for him! Thank you so much for this article. I have been watching Dan and his company for quite some time now. This product is amazing. I’ve videoed my own version a few years ago. It was quite interesting. He set The tree in his mother’s front yard on fire! And then proceeded to put it out in seconds. End it was not hot to the touch nor was it scorched. Many more people should know and respect this product. The bonus is that it’s also good for the environment!! It’s not the California Department of Forestry and Wildfire Protection, it is the California Department of Forestry and Fire Protection. The Agencies firefighters are trained and function in ALL aspects of fire protection.